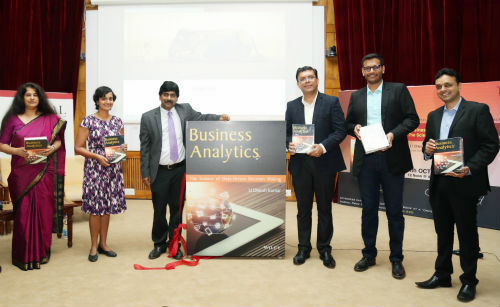 Bengaluru: Enriched by the author’s teaching, research and consulting experience, the book, ‘Business Analytics – The Science of Data-Driven Decision Making’ by Prof. U. Dinesh Kumar was launched at Indian Institute of Management Bangalore on Saturday (Oct 14). Prof. Dinesh Kumar is Chairperson of the Decision Sciences and Information Systems area at IIMB and heads the Data Centre and Analytics Lab, an initiative of IIMB to support interdisciplinary empirical research using data on primarily Indian as well as other emerging markets. Releasing the book, Avnish Kshatriya, Principal Evangelist and Head, Technology Strategy at Wipro Analytics, said: “These are interesting times. Business Analytics is creating opportunities for new business models. Prof. Dinesh Kumar’s book connects the learning dots in the industry”. The book, published by Wiley India, has been written with the aim of becoming the primary resource for students of Business Analytics and provides a holistic perspective of analytics with theoretical foundations and applications of the theory using examples across several industries. The book explains the foundations of data science and addresses all components of analytics such as descriptive, predictive and prescriptive analytics topics which are discussed using examples from several industries, as well as nine analytics case studies distributed by Harvard Business Publishing and used by several institutes across the world. It is enriched with 10 years of teaching experience of the author in various programmes of IIM Bangalore and several training and consulting projects carried out by him. It provides equal importance to theory and practice with examples across industries and the case studies provide a deeper understanding of analytics techniques and deployment of analytics-driven solutions. The book offers real data sets for students to practice various analytics techniques, consists of a discussion of analytics applications in industries such as banking and finance, eCommerce, healthcare, manufacturing, retail and services and has multiple-choice questions at the end of the chapters which will ensure that the reader has understood the learning outcomes.